VroomVroomVroom can help you find a cheap car hire in Hobart Airport. We compare rental cars from leading suppliers including Avis, Budget, Hertz, Europcar, Thrifty and Enterprise. You can easily compare prices to find the cheapest rental car. Take a self-drive holiday in Tasmania by flying into Hobart Airport and then collecting a really cool car hire. Tasmania is one of the most beautiful states in Australia, with many natural landscapes to enjoy. By booking a rental car, you can enjoy all that Hobart and Tasmania have to offer at your own pace. If you're already in Hobart, you can also book a car to collect from the city centre. Great rates - We have a Price Promise that will help you find the best deal. Easy and quick - Browse through our list of car rental deals and choose the one that will best suit your budget and preference. Fill in the form, make a booking and receive the booking confirmation code right away. Convenience - Instead of falling in line at the rental car counter or taking a shuttle to pick up your rental car, you can directly pick up your hire car at the airport. Wide selection of cars - Whether you need an economy car, SUV or a premium vehicle, you can easily find a specific car in our list. Just filter the list to see your preferred vehicle type. Trusted since 2001 - We have been helping people find the perfect rental car for years. Feel free to contact us via chat, email or phone call so we can assist you too! You can also reach out to use on Facebook​ and Twitter​. Hobart Airport (HBA) is just 17 kms from Hobart city, a 15 minute drive on a dual carriage highway. 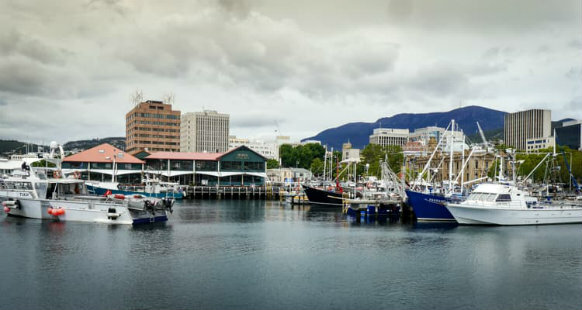 Hobart is unique geographically, set in a stunning location on the banks of the river Derwent, and nestled at the foot of Mt Wellington. To make your driving holiday in Australia more safer and enjoyable, take time to read this helpful guide to Australian road safety, rules and regulations. Feedback: Mostly, booking was really easy, however the information about excess reduction / insurance was presented in quite a confusing way.